I must say that I am very excited about this Beer Mail from Wild Rose Brewery in Calgary, AB. I have been covering their releases for over a year now, and this will be the first time i get to enjoy one of their beers. 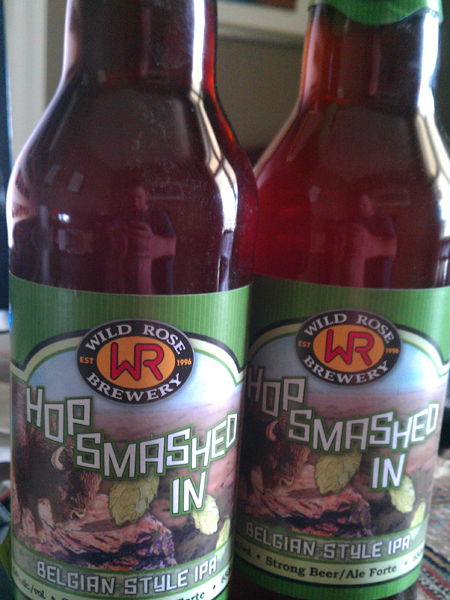 A special seasonal brew, "Hop Smashed In" looks to be right up my alley. A Belgian style IPA that is sure to delicious! Unfiltered and 6.4% ABV, this will indeed be a treat! "This unfiltered amber coloured ale is a unique version of our IPA. A generous amount of hops are "smashed" into the brew along with a specially selected Belgian yeast, to provide notes of fruit and spice. Unique? Yes. Delicious? We think so! "